Fall is here. Anytime the seasons change, it’s fun to update your home décor. Here are our top 4 Decorating Ideas for fall. From simple accessory swaps to painting – whatever you choose, make your home beautiful this fall. If you have a mantel, you have a great opportunity to change your décor for the season. Swapping accessories and dressing up your mantel for the season will help your room feel renewed without a major renovation. Give Thanks Mantel from Adventures in Decorating. 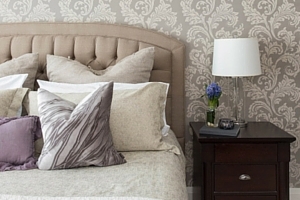 Add some fall colors to your bedroom or living room by swapping out pillows and bed linens. It’s a fairly easy change and you can always switch back to your summer colors again next year. Fall colored bed linens feel cozy and there’s nothing like stepping out onto nice soft Tigressá H2O carpet. An accent wall is a little bit more work but will make a big impact on your room. Choose a rich fall color like a warm brown. Look at what a difference it can make. Accent Wall Idea from Lewis Cave Home Design Inspiration. Nothing gets your room ready for cooler weather like a warm area rug. Adding an area rug can change up the look of your entire room. Already have carpet? It’s ok to add a rug on top of carpet or even layer a couple rugs. Don’t be afraid to get creative. It can always be moved or updated. The area rug in this space from Melissa Davis helps make this room feel cozy.